He rode along a road, and a wide road it was, and he saw a fire-bird’s feather lying there and flaming like fire. Said his horse to the archer: "Leave the feather where it is, for if you don’t you will know a great misfortune." Now, this made the archer stop and think. In the end, he decided to take it, and, picking it up, carried it away with him and presented it to the king. "Many thanks to you, Archer!" said the king. "But since you were able to fetch its feather, you must fetch me the fire-bird itself if you don’t it’ll be out with my sword and off with your head!" The archer went back to his horse weeping bitterly. "Why do you weep, Master?" the horse asked. "The king has ordered me to fetch him the fire-bird." "I told you not to take the feather. Still, you must not fear or give way to despair. You are in no great trouble now, there is worse to come! Just go to the king and ask him for a hundred bags of corn to be strewn over that field yonder." This the archer did, and the king had a hundred bags of corn strewn over the field. At dawn on the following day the archer rode to the field. He unbridled his horse, let it roam there at will and himself hid behind a tree. All of a sudden the wind swept over the forest and sent it rustling, the sea rose in waves, and the Firebird came flying to the field. Down it dropped and began pecking the corn, and the archer’s horse ran up and stepped hard on one of its wings, pinning it to the ground. The archer then rushed out from behind the tree, and, binding the Firebird with a rope, got on the horse with it and rode at a gallop for the palace. 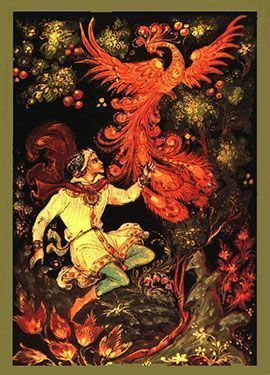 He presented the Firebird to the king, who was greatly pleased, thanked the archer for serving him so well, promoted him and at once set him another task. "You were able to fetch the fire-bird, so you should be able to fetch me the maid I wish to marry, Princess Vassilissa. She lives at the very end of the earth, where the bright sun rises, and it is her I want and none other. If you bring her to me, I will shower you with gold and silver, but if you don’t, it’ll be out with my sword and off with your head!" The archer went back to his horse weeping bitterly. "Why do you weep, Master?" the horse asked. "The king bids me fetch him Princess Vassilissa." "Do not weep or be sad. You are in no great trouble, there is worse to come! Go to the king and ask him for a gold-topped tent and for food and drink for you to take with you on your journey." The king gave him food and drink and a tent with a top of gold, and the archer got on his horse and set off on his way. Beyond thrice-nine lands he traveled, and whether a short or a long time passed nobody knows, but he came at last to the end of the earth, where the bright sun rises from the blue sea. And there on the sea, in a silver boat that she pushed with a paddle of gold, was Princess Vassilissa herself. The archer unbridled his horse and let it roam at will in the green meadow and pick at the fresh grass, and then he set up the gold-topped tent, put foods and drinks on a table, and sat down to eat and drink while he waited for Princess Vassilissa. And Princess Vassilissa saw the gold top gleaming in the sunlight, paddled to shore, and, stepping out of the boat, stood there looking admiringly at the tent. "Good morrow to you, Princess Vassilissa!" the archer said. "Pray come in and share of my board and taste of the wines I brought from far-off lands." Princess Vassilissa came into the tent and she and the archer ate and drank and made merry. A whole glass of wine did she drink and was so overcome that she fell fast asleep. The archer called his horse, and when it came running, folded the tent with the top of gold, picked up Princess Vassilissa, and mounted the horse. The king was overjoyed at the sight of Princess Vassilissa. He thanked the archer for having served him so well and gave him a still higher rank. But when Princess Vassilissa awoke and learnt that she was far, far away from the blue sea, she began sobbing and weeping and her face turned dark with grief. And though the king pleaded with her not to be sad, there was nothing he could do. He begged her to marry him, but she said: "Let him who brought me here go to my realm at the end of the earth and fetch my wedding dress which lies under a large rock in the middle of the sea. I will not marry without it!" The king sent for the archer. "Go at once to the end of the earth where the bright sun rises. In the middle of the sea you will find a large rock and under it Princess Vassilissa’s wedding dress. Bring the dress here, for I wish to wed without delay! If you bring it, I shall reward you richly, more so than ever before, but if you don’t, it’ll be out with my sword and off with your head!" Back went the archer to his horse weeping bitterly. "I will not escape death this time!" said he to himself. "Why do you weep, Master?" the horse asked. "The king bids me fetch him Princess Vassilissa’s wedding dress from the bottom of the sea." "Didn’t I tell you not to take the Firebird’s feather? But never fear, you are in no great trouble, there is worse to come! Get on my back and let us go to the blue sea." Whether a short or a long time passed nobody knows, but the archer came to the end of the earth and stopped on the shore of the blue sea. A huge lobster came crawling over the sand toward him, and the horse saw it and stepped on its tail with its hoof. Said the lobster: "Spare me, Horse, do not let me die! I will do whatever you ask." And the horse said in reply: "There is a great rock lying on the bottom of the sea and hidden under it is Princess Vassilissa’s wedding dress. Fetch the dress for me!" "Poor, unhappy man that I am!" thought he. 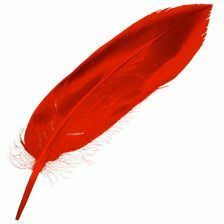 "What made me take the fire-bird’s feather? Why didn’t I listen to my horse?" And recalling the horse, he said to the king: "Oh great king, my ruler, allow me to bid my horse goodbye before I die!" "Very well," said the king. The archer went to see the horse, and the tears poured from his eyes. "Why do you weep, Master?" the horse asked. "The king bids me dip myself in boiling water." "Fear nothing and do not weep, you will not die!" said the horse, and he cast a spell over the archer that he might not get scalded by the boiling water. The archer left the stall, and the king’s servants seized him and threw him into the cauldron. He took a dip and another and jumped out of the cauldron, and lo and behold! — So handsome had he become as neither pen can write nor tongue tell! Seeing this, the king took it into his head to take a dip himself. He jumped into the cauldron and was boiled alive! And after he was buried the archer was chosen to rule the realm in his stead. He married Princess Vassilissa and they lived together for many long years and were as happy as happy can be.